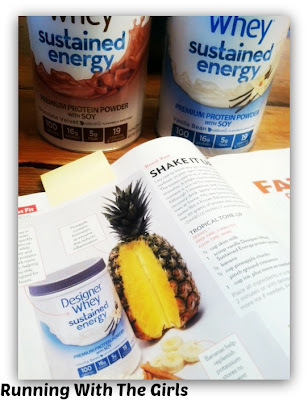 Disclaimer: I was provided two Designer Whey canisters to review as part of my affiliation with FitFluential. As always, all opinions expressed on my blog are 100% my own. I love smoothies! I enjoy putting a bunch of delicious ingredients into my blender, blending away, and tasting the sweet rewards of my experiment. Having an excellent protein powder to add into the mix only makes my smoothies better in terms of taste and a punch of healthy. Smoothies are incredibly easy to make in the morning and just bring along with me, where I happen to be going for the day - work, shopping, garden, or just to the deck to enjoy my lovely summer. I especially had a lot of fun making some fun smoothies with Designer Whey Sustained Energy Protein Powder. 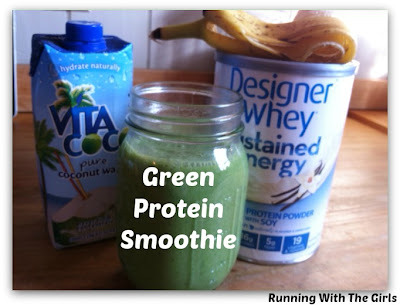 The second smoothie I made was a Green Protein Smoothie. I love green smoothies very much. They are packed full of vitamins, which made complete sense to me to add it with the Vanilla Bean Designer Whey, which would only results in an even healthier green smoothie. Ingredients: handful of kale, coconut water, banana, and Vanilla Bean Designer Whey. *Hint: Blend the kale and coconut water for a few minutes prior to adding everything else, especially if you have a regular blender like I do. This gave a chunk-free green smoothie and that I could not get enough of! I'm a huge fan of anything peanut butter and chocolate. When I found powdered peanut butter, I fell in love because I could continue with my love of peanut butter without all of those calories. 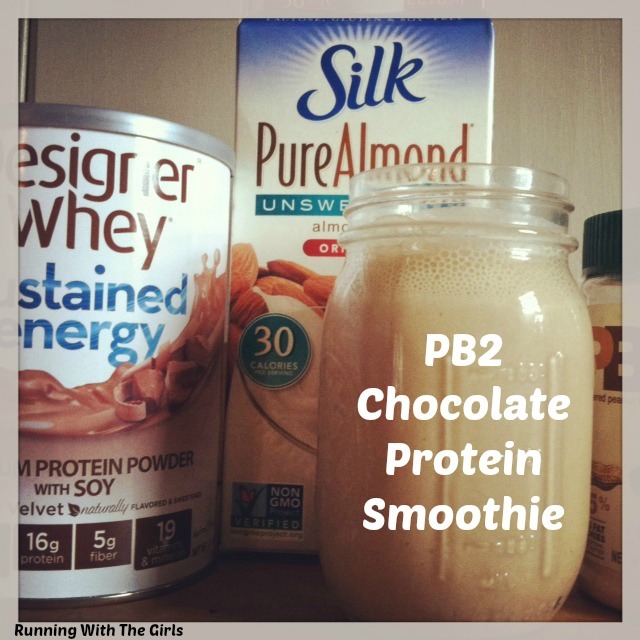 When I added the PB2 to the Chocolate Velvet Designer Whey Sustained Energy and almond milk, I had another smoothie winner. I'm not doing any long runs right now, but Ward is still in his peak marathon training. And since I'm the best wife, I almost always make him some kind of baked good for him to eat when he comes back from his long runs. 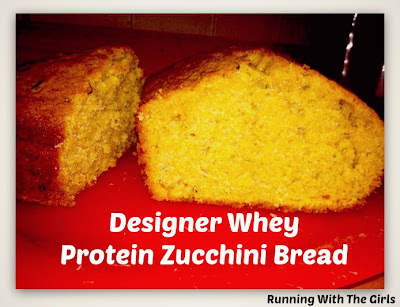 Last night he and his running guys went on their 20-miler, and I made sure I had something yummy and delicious waiting for him - Designer Whey Protein Zucchini Bread. I had some extra batter, so I made myself and the kids some mini muffins which we enjoyed eating before he came home. The Vanilla Bean Designer Whey Protein Powder gave these muffins a powerful pack of protein and a great vanilla flavor. Since I was adding in protein powder, I reduced the amount of flour and I omitted the vanilla and reduced the sugar. Other than that, I just followed the recipe for a zucchini bread. Designer Whey has generously offered 6 of my readers the chance to win their own canister of Designer Whey Sustained Energy! To enter, you just need to comment below with which flavor you would choose if you won. Not sure of the flavors? Read above or go here to see which of the Sustained Energy Protein Powders you'd like. The giveaway will run from today - August 20, 2013 through Friday, August 23, 2013. I will announce the 6 winners on the blog on Saturday, August 24. I love chocolate but I believe I'd pick the vanilla bean because you recipes look so delicious I'd like to try a few!!! Chocolate Velvet. I'd like to try these! I would love to try the chocolate velvet! I would love the Vanilla Bean, but know the boys would really enjoy the Chocolate Velvet! Vanilla Bean for sure! Would love to try that zuchinni bread recipe! Great review!!! I'll have to try out some recipes! Wow that looks delicious! I really want to try the Vanilla Bean and mix all kinds of goodies in it. Great review! Great review! I've heard lots about DW...I've never seen it here in Canada though! Dying to try this! Vanilla Bean would be great. I would go with the chocolate velvet. 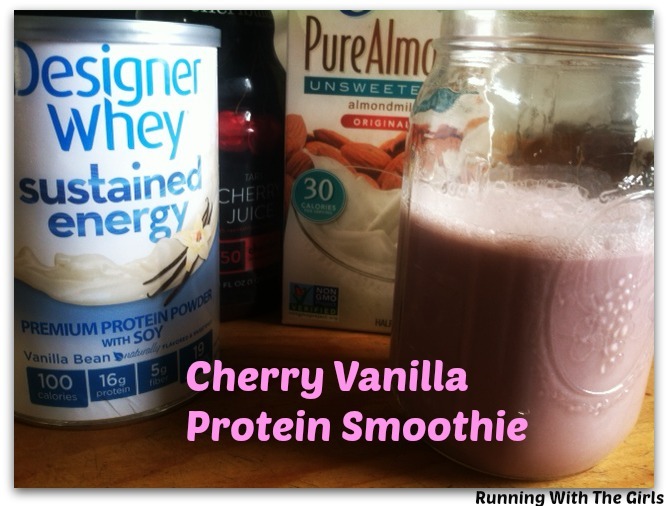 I love trying new protein powders! Would love to try the chocolate velvet! Your recipes looked great too. Id love to try the chocolate velvet designer whey! I am in search of an awesome protein powder. Would like to give the chocolate a try. I'd love to try them all but vanilla would be my first choice. Thanks for a great giveaway. OOh, Chocolate Velvet sounds awesome, although I am looking for a better tasting vanilla. Definitely chocolate velvet! Thanks for the recipes! They sound delish!! Nicole - You are a winner!!!! Please email me by noon, Monday with your shipping info! Carrie - You are a winner! Please email me by Monday, noon with your shipping info so I can forward it!!! I sent you an email! Thanks! !